Offering you a complete choice of products which include graphite tiles. 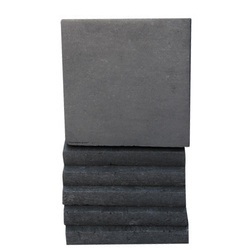 We are one of the leading manufacturer and exporters of Graphite Tiles. These are suitable for manufacturing Anodes, Runout Plates, Diffusion Heads, Furnace Covers, Boats, Furnace parts, Sintering Boats & Trays, Welding Plugs, Sliding Bearings, Welding Back-Up Plates, Lube Blocks, Trunnion Wheel Plates. These products are designed as per the needs and requirements to ensure the satisfaction of esteemed clients. Looking for Graphite Tiles ?